Posted under Parents' Articles. Updated 5 January 2017. Calcium is a mineral that gives strength to your bones. Calcium is also necessary for many of your body’s functions, such as blood clotting and nerve and muscle function. During the teenage years (particularly ages 11–15), your daughter’s bones are developing quickly and are storing calcium so that her skeleton will be strong later in life. Nearly half of all bone is formed during these years. It’s important that your daughter gets plenty of calcium in her diet, because if the rest of the body doesn’t get the calcium it needs, it takes calcium from the only source that it has: the bones. This can lead to brittle bones later in life and broken bones at any time. Unfortunately, only 12% of teen girls actually get enough calcium in their diet. Osteoporosis is a bone disease that causes bones to become fragile and more likely to break. It develops slowly and is usually caused by a combination of genetics and too little calcium in the diet. Osteoporosis can also lead to shortened height because of collapsing spinal bones and can cause a hunched back. How do I know if my daughter’s at risk? Several factors can put a young person at risk for developing osteoporosis. Osteoporosis can be prevented. There are some risk factors that your daughter cannot change (such as her race and family history), but there are some she can! She should eat a healthy diet, exercise on a regular basis, and not smoke! How much calcium does my daughter need? Children and teenagers between the ages of 9 and 18 should aim for 1,300 milligrams per day, which is about 4 servings of high–calcium food or drinks. Each 8–ounce glass of milk (whether skim, 1%, 2%, or whole) and each cup of yogurt has about 300 milligrams of calcium. Adults 19 to 50 years of age should aim for 1,000 milligrams per day. How do I know how much calcium is in the foods my daughter eats? For foods that contain calcium and have a nutrition facts label, there will be a % Daily Value (DV) listed next to the word calcium. To figure out how many milligrams of calcium a serving of food has, take the % DV, drop the % sign, and add a zero. The table below shows how much calcium is in some calcium–rich foods from different food groups. You probably know that dairy foods such as milk and cheese are good sources of calcium, but did you know that tofu and beans contain calcium, too? Even if you don’t drink milk or eat cheese, you can get the calcium you need from other foods. 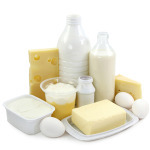 See the list of high–calcium foods at the end of this guide. What if my daughter is lactose intolerant? If your daughter is lactose intolerant and can’t drink milk, there are plenty of other ways she can get enough calcium. These include eating foods high in calcium and drinking fortified soy milk, fortified juice, or Lactaid milk (the lactase enzyme that your daughter is missing has been added into the milk). She can also take lactase enzyme tablets before eating dairy products to help digest the lactose sugar in the milk. Some people who are lactose intolerant can tolerate having small amounts of milk or other dairy products at a time. How can my daughter get more calcium in her diet? Slice of cheese with a bagel or English muffin. Most cheeses, except for cream cheese, are high in calcium. Cereal bars or energy bars that contain calcium. Check the label to see if calcium is listed. What if my daughter just can’t get enough calcium in her diet? It’s best for your daughter to try to meet her calcium needs by having calcium–rich foods and drinks, but some teens find it hard to fit in 4 servings of high–calcium foods daily. If she doesn’t like dairy foods, calcium fortified juice or soymilk, she may need a calcium supplement. Calcium carbonate (for example, Viactiv® or a generic chewable) and calcium citrate (for example, Citracal®) are good choices. Most calcium supplements have between 200 and 500 milligrams of calcium. Remember, her goal is 1,300 milligrams of per day. If she has to take more than one supplement per day, it is best to take them at different times of the day because the body can only absorb about 500 milligrams of calcium at a time. She shouldn’t count on getting all of her calcium from a multivitamin. Most basic multivitamin/mineral tablets have very little calcium in them. Look for a calcium supplement that has vitamin D added. Vitamin D helps the body absorb calcium. Know that a dietitian or health care provider will be able to support her with recommendations on what supplement will best suit her needs.